Pic Nintendo has abolished hinges and autostereoscopic 3D displays to create a new handheld console called the 2DS. Keen to kick smartphones and tablets off the mobile gaming throne, Ninty has revealed a portable games device that doesn’t sport a clamshell casing and looks a bit like a fondleslab. It does feature all the usual DS controls, including a stylus, and, bizarrely perhaps, two separate displays: one 3.5 inches, the other 3.0 inches, as per the original 3DS. It is, said Nintendo, a “handheld portal to a world of amazing games and features”. You can say that of any Android or iOS device, of course, and (just about) Windows ones too. Conveniently for buyers and sellers of kid-friendly games software, the 2DS runs 3DS and DS titles, of which there are a good 2,000. Well “almost all” of them, according to Nintendo – it’s the ones that require accessories that plug into the Game Boy Advance slots on the previous DS machines’ that won’t run on the new device. 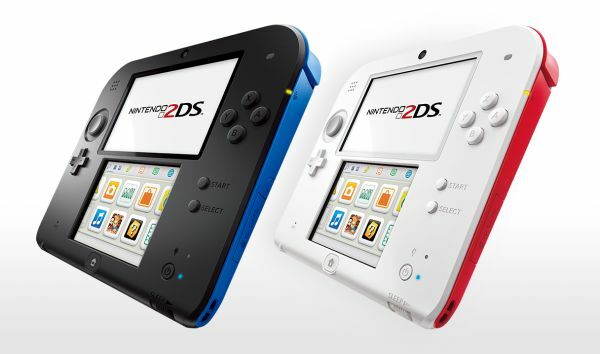 The 2DS will come in two colour schemes: black-and-blue and red-and-white. Both come with a 4GB SD card. The console is set to go on sale on 12 October. No word yet on UK pricing, but it’ll be $130 in the US, so expect to pay around £100 here. You can pick up the clamshell DSi – conveniently stow in nippers’ luggage – for little more than that.